Following the 2006 tang stamp era in which the only patterns made were the #23 Pioneer knife & #73 Scout knife, GEC introduced four distinct new knife patterns in 2007. The first new pattern introduced with a 2007 tang stamp was a cigar style frame that has been configured as a stockman, a Jack, a whittler, a muskrat, & a moose. The next three were all fixed blades of various lengths that were assigned pattern numbers 10, 50, & 60. 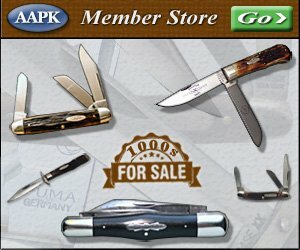 Examples of all of these 2007 stamped knife patterns along with most others can be seen in picture form on our GEC Knife Image Gallery.